The student Gi is a quality suit complete with a white belt in 100% cotton in sizes from 100cm to 210cm tall. 100 to 160 cm are £10 and 170cm and above are £15. We will normally have these in stock. Silver Tournment Gi: A 14oz European cut Gi sizes 140cm to 210cm (Available in half sizes). White Diamond Gi - A 14 oz Japaneese cut suit with 2 pairs of pants, Kata and Kumite. 100% canvas and cotton, 140 to 210cm: below 160cm - £50, 160 to 175cm - £55, above 175cm - £60. The discounted price represents about 30 to 35% off the RRP. Just ask Paul when he is training at your club. Kato Shihan has announced his diary for 2006, Venues, timings and costs are to be confirmed. Details of the York events will appear a few weeks before the training so please keep looking. Non IJKA members are welcome to train with Shihan at the York courses, but please contact me so I can pass your details onto Sensei Ian Shaw who arranges the training. November 25th & 26th - York Cse and Haxby 25th Aniversery celebrations! 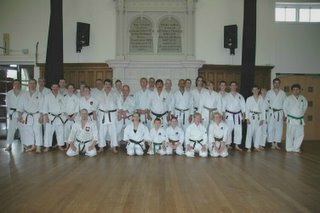 Kato Shihan has provisionally booked the first York Kata Course and grading for the weekend 25th /26th February 2006. At the moment these dates are not confirmed until Shihan can "firm up" his busy schedule. Please ensure that you pencil this date in your diary. Once confirmed, I will publish venue, times and costings. 9.30am to 1pm (10am start) Training and Grading. Note:- There is no Grading only, if you want to grade you must train! This is a benefit to all karateka, you are not always at your best under grading conditions but if the examiners have had the opportunity to watch you train it can make the difference between a pass and a fail or a temporary or full grade. We are fortunate that Shihan agrees to come to York 3 or 4 times a year. All karateka should make every effort to attend courses, they are not for grading students only. We are particularly proud of the achievements of four of our younger Karateka that joined the club soon after we relocated to Barlby. 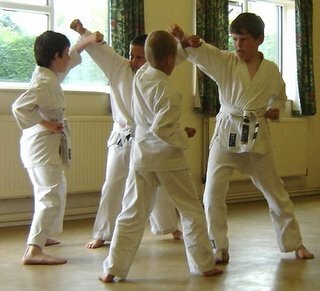 They have all been training for over two years now showing a tremendous commitment to Karate. Daniel, Thomas, Adam and Sam. They are being graded on their basics. A series of structured attack and blocks, this is the first step in sparring. They have all successfully graded five times in a row under the critical eye of our Chief Instructor Kato Shihan 8th Dan and Gullen Shihan 6th Dan. This ensures that the high standards of Shotokan karate are maintained within the IJKA. In the IJKA anyone under Eleven will commence grading at 12th Kyu and have three "Pee-Wee" gradings before they start the full syllabus. 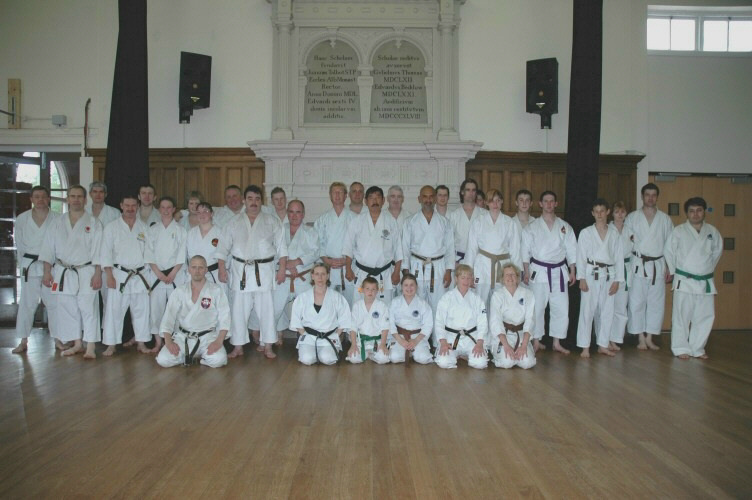 12th Kyu - 25/07/04, 11th Kyu - 7/11/04, 10th Kyu - 13/3/05, 9th Kyu - 5/6/05 and 8th Kyu - 9/10/05. We have high hopes for them all in 2006 and expect to see them all wearing a colour belt soon. Daniel Kozelko - A strong youngster full of budo spirit, his Kia's are enough to scare anyone! He once shocked Sensei Mick Gude when partnered with him for the first time. When he was instructed to punch speed and power that was exactly what he did. Thomas Robinson - winner of the attendance award in 2004, we have seen his concentration improve ten fold in the last two years. 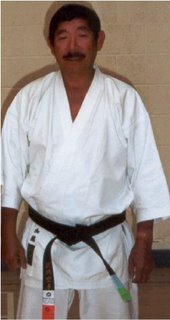 Thomas has had to work hard at his karate and it is a tribute to him that he has carried on training hard when many would have given up. I am sure he will continue to surprise us with his achievements in 2006. Adam Preece - A very good all round Karateka, he achieved 2nd place in the SSKC Kata comp in 2005. His maturity is a credit to his years and is oftern seen as a calming influence to the famous four. There is bags of Karate potential in this young karateka. Sam Dennis - Quite a bit younger that the other three Sam has had to work hard to keep up. He has always been partnered with older Karateka that have raised his standard to their own. We are sure that Sam will continue as he has began. We have seen all four develop in different ways and are equally proud of of them all. We will not all be able to attain the highest standards in shotokan karate but we will all mature better for its study. The Competition and the belt that you wear are only a small part of "the way".